Mad To Be Normal directed by Robert Mullan [Gitel (2016); We Will Sing (2015) Laiskai Sofijal (2013) is a ‘faction’ look at R.D. Laing, the famous psychiatrist and one of Scotland’s greatest ever minds. Working out of Kingsley Hall in East London throughout the 1960s and 1970s, Laing’s infamous anti-psychiatry experiment – a medication-free sanctuary which made headlines around the world. His revolutionary methods involved experimenting with LSD on his patients and practicing a form of self-healing known as metanoia, causing outrage and controversy in the medical profession and radically changing attitudes and perceptions of mental health around the world. During the 1960s and 1970s Laing was an international celebrity and a major figure in counter-culture. In Santa Monica, 4,000 people turned out to see him deliver a lecture, a week after Bob Dylan had pulled in the same capacity audience. Dubbed the “white Martin Luther King.” and ” the high-priest of anti-psychiatry” he was opposed to punitive and barbaric treatment methods like ECT (electroconvulsive therapy) and isolation. His books topped student reading lists the world over, as his language excited and enthralled them: “a child born today stands a 10 times greater chance of being admitted to a mental hospital than to a university….perhaps it is our very way of educating them that is driving them mad… [and]…”so- called ‘normal men’ have in the last 50 years killed perhaps 100 million of their fellow normal men”. It was opinions like these which turned the psychiatric establishment against him as a dangerous radical.A superb ensemble cast headed by a strong performance by David Tennant (who had a career launching lead role in Takin’ Over the Asylum Donna Franceschild’s TV mini series in 1994) as the charismatic, mercurial and elusive, RD Laing. Tennant’s nuanced, complex performance reflects both Laing’s great personal charm and his high intelligence and arrogance and a darker side which made it difficult for people like lover Angie (Elisabeth Moss) to get close to him. Michael Gambon and Gabriel Byrne give heartrending performances as Kingsley Hall residents. Cinematographer Ali Asad appears to have shot many scenes through a hazy fog of cigarette smoke or joss sticks which complements well a soundtrack including Donovan, The Kinks and the Grateful Dead. 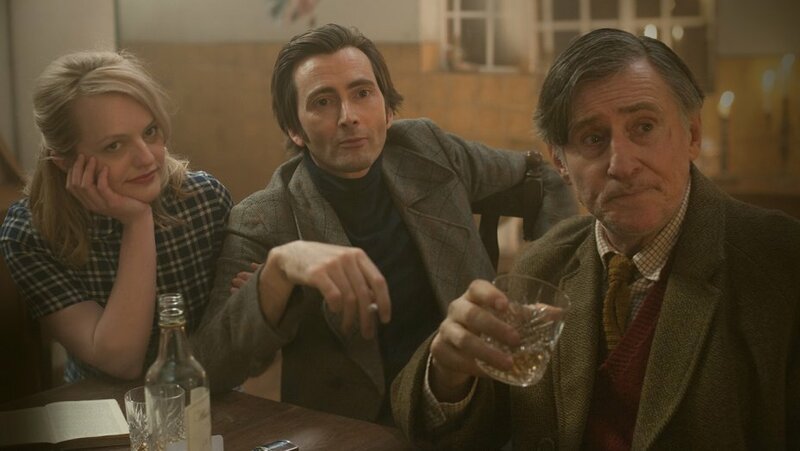 Mad To Be Normal starring David Tennant, Elizabeth Moss, Gabriel Byrne, Sir Michael Gambon. Producer: GSP Studios, Gizmo FIls, Bad Penny. Director: Bob Mullan. DoP: Ali Asad. Producers: Peter Dunphy, Victor Glynn, Julian Hicks, Phin Glynn, Alan Latham, Charlotte.